Action from the first tie between Stamford AFC and Peterborough Sports. Photo: James Richardson. Two local non-league heavyweights clash head-on in an FA Cup replay tonight (September 4). Peterborough Sports host Stamford AFC in a preliminary round tie at the Bee Arena (7.45pm) with both teams sitting on top of their respective Evo Stik Leagues. It was a 1-1 draw at Stamford over the Bank Holiday weekend with Sports grabbing a 75th-minute equaliser. A big crowd is expected at Sports’ Lincoln Road base. The winners will play away at Basildon United in the qualifying first round. 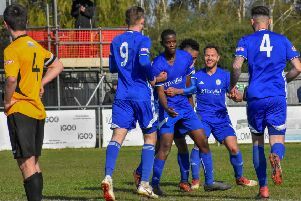 Deeping Rangers will be underdogs in their replay at AFC Rushden & Diamonds, while Wisbech will be expected to beat lower level Sileby Rangers at the Fenland Stadium. Yaxley will be up against it in a first round tie in the Southern League Challenge Cup at In2itive Park as higher level St Ives are the visitors. Preliminary Round replays: AFC Rushden & Diamonds v Deeping, Peterborough Sports v Stamford, Wisbech v Northampton Sileby Rangers. Southern League Challenge Cup: Yaxley v St Ives.